Please phone for availability for new bookings at the Kalihi gym! 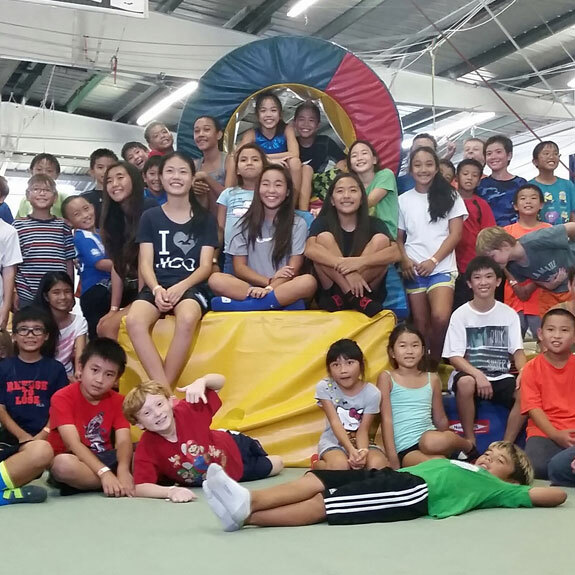 Hawaii Academy promotes lifetime fitness and physical activities throughout life. 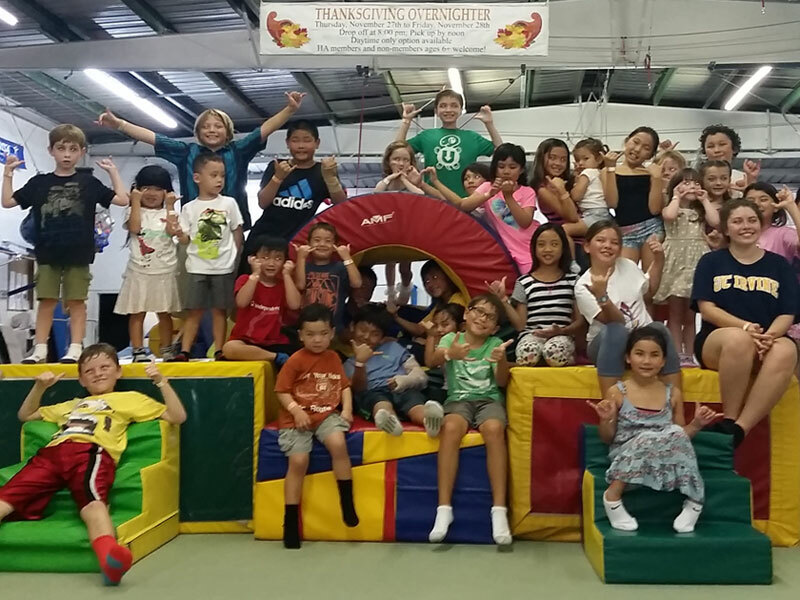 Try our active alternative to traditional birthday parties. We think you, the honoree, and your guests will enjoy the fun, safe, educational experiences we offer. Work with our staff to design a unique event that educates and entertains your guests. Coupons for a free lesson for all participants and guests, compliments of the honoree or event sponsors. 1. 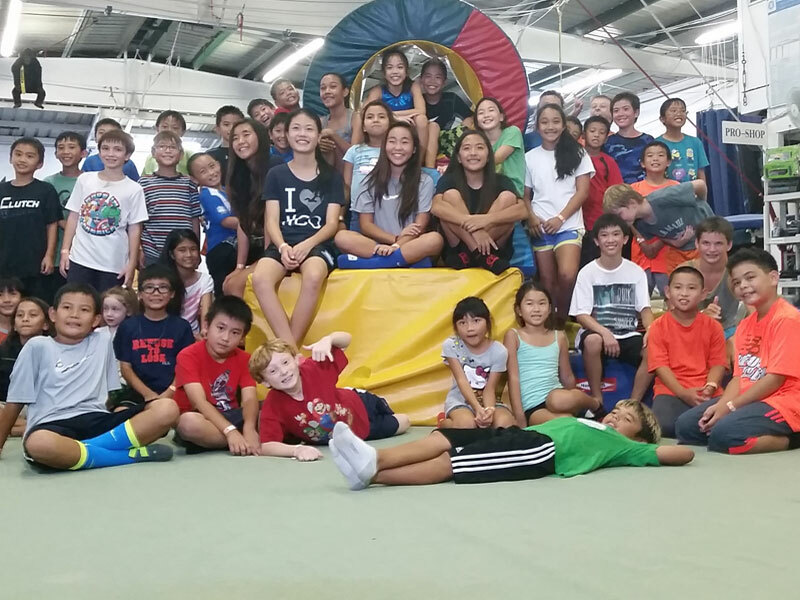 To schedule your party, please phone us: 842.5642 for Kalihi and 422.2223 for Pearl Harbor. We recommend phoning at least two months in advance. 2. Submit Party/Celebration Contract with deposit. 3. Arrive at least 10 minutes before event. 4. Bring decorations, tablecloths, paper goods, refreshments, food, matches, candles, utensils, camera, and music. 5. Conduct your 30-minute program with food, refreshments, singing, etc., and hold the participants until the final instruction. 6. Pickup table area (we do everything else). 8. Complete and leave or mail in the Event Feedback/Evaluation Form as soon as possible after event. Bring socks (preferably socks with grip soles) or gym shoes. No loose or baggy clothing, jeans, belts, or jewelry(e.g., earrings, necklaces, watches, rings). Click here to view more policies. Discuss party design and select the instructor. Print out the Party/Celebration Contract and mail it in (or drop it off at the reception office of the Academy) with a $100 or more deposit. Confirm with the instructor the specific details of the event and send out invitations with our Release of Liability/Permission to Participate Form attached. Identify the number expected to participate. Check our availability calendar below to choose a date! Although almost any arrangement can be contracted, our most popular format consists of 90 minutes of mini-lessons and instructions/supervision on a number of events or stations (according to the age and number of attendees) provided by our skilled staff and 30 minutes for the food and celebration at tables off of the instruction area conducted by the client. We provide party/celebration activities for nearly all age groups from 2 to 100 yrs. Many event offerings are possible and contracts are flexible but the most popular format is a 2-hour birthday party for which we charge $10 per participant ($275 minimum for ages 6+; $300 minimum for ages 5 and under). Additional time, if available, can be contracted at proportional pricing. (The event is not booked until we receive the signed contract, a $100 deposit, instructors are confirmed, and the event is put on the Academy calendar. Deposits can be made over the phone by credit card, mailed, or brought into the gym. Appointments not confirmed and booked (contracted) by seven days prior to the event will be released to anyone else interested in booking that date. The balance of the account due must be paid immediately following the event. Gratuities are made directly to the party instructors and are greatly appreciated. Participants must be at least 2 years old and screened by Dr Max if older than 65 years. If participant is 3 or under they need an adult assistant. A 10% discount applies for Academy members and repeat contracts (3+ parties). Adults (usually parents) must sign a release of liability if they go on the floor and participate in any way. 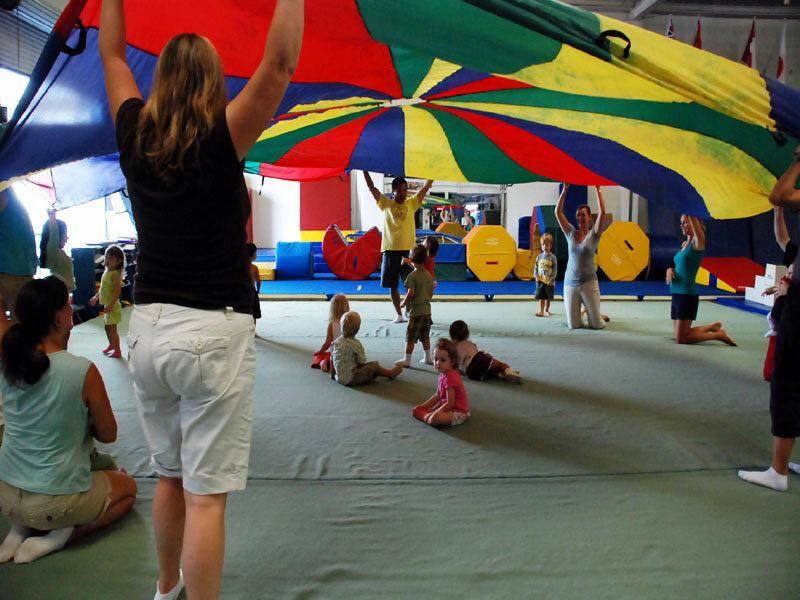 Consider having adult participants in their own group at the same time as the kids do their party (an additional instructor is needed). Parties booked on holidays or gym closures are subject to availability and an additional fee. A 1.5 hour birthday party for $220 plus $10 per participant over 10 (e.g., 16 guests cost $230). This format consists of 1 hour of stretching and instruction and 1/2 of an hour for food and celebration. Academy members receive a 10% discount off the minimum price. 5:30-5:35 pm- Confirm format and number of participants, collect waivers, etc. 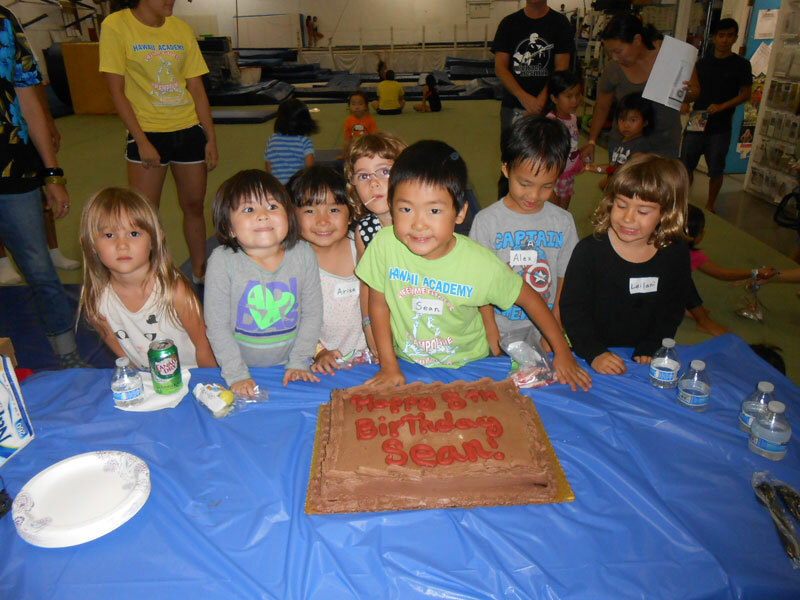 A 2 hour birthday party for $275 plus $10 per participant over 10 (e.g., 16 guests cost $260). This format consists of 90 minutes for instruction/supervision and 30 minutes for food/celebration and closeout. Academy members receive a 10% discount off the minimum price. Other formats are available at the discretion of the client and instructor. Also, formats are modifiable if necessary or mutually agreed.